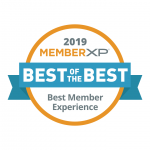 MemberXP, a credit union-specific member experience platform, is proud to announce the “Best of the Best” credit unions in member experience for 2019. MemberXP administers both the MemberShoppers and MemberView experience measurement and member journey optimization programs for more than 100 credit unions across North America. Participating credit unions have an average asset size of $700 million, one quarter of them have more than $1 billion in assets. Members submit surveys based on specific interactions they’ve had with the credit union such as opening a new account or closing a loan. The credit union must have achieved a high score on two metrics: the Member Effort Score, which measures each of use, and the Net Promoter Score®*, which measures the likelihood the member would refer the credit union to others. Members and/or independent evaluators complete detailed mystery shops. The credit union much have achieved high scores in the areas of member advocacy, member appreciation, and member education. Congratulations to these credit unions and thank you for showing consumers the real credit union difference! Constance Anderson is the president and founder of MemberXP.